I love frogs. Who knew? I used to be creeped out by them. My blood would run as cold as theirs if I so much as laid eyes on one. But once I got to know them, it didn't take long before I made them part of my world. You can make my frogs part of your world, too. Just take a look at the gallery. Watching frogs taking the sun can be completely mesmerizing – a pastime that leads to a special state of Zen. Their stillness is infectious. And perfect for photos. The same frogs come back to their rocks and logs, day after day. They take on names and stories. Painting their portraits allows me to keep the frogs close throughout the fall and winter. 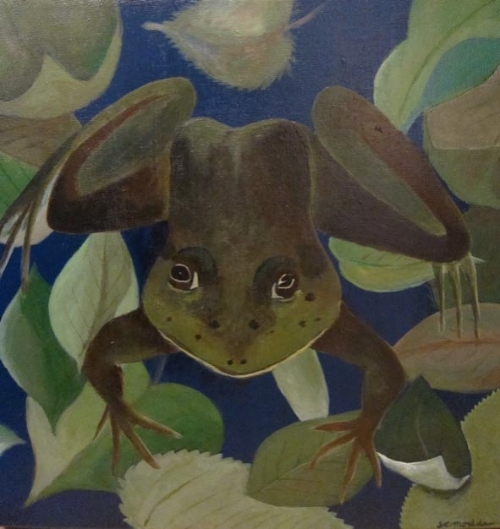 But with spring peeping ‘round the corner, I look forward to a new batch of spring peepers who will open another season of frogs and mindfulness.